School districts in the state of Missouri are changing their science curriculum for Grades 6 to 8. The reform primarily changes science instruction from a spiral approach to a field-focus curriculum. The Philippines, on the other hand, with DepEd's K to 12 goes in the opposite direction. Without debating which direction is the correct one to take, both need to face the challenge of a major transition. Poor implementation of an education reform leads to failure even if the change is the correct prescription. A major part of the implementation is the transition stage, which is crucial for the success of the reform. It is therefore necessary to pay close attention to the transition process as this stage can easily lead to failure if not implemented correctly. Missouri's efforts are assisted by institutions of higher learning within the state. One is Lindenwood University. 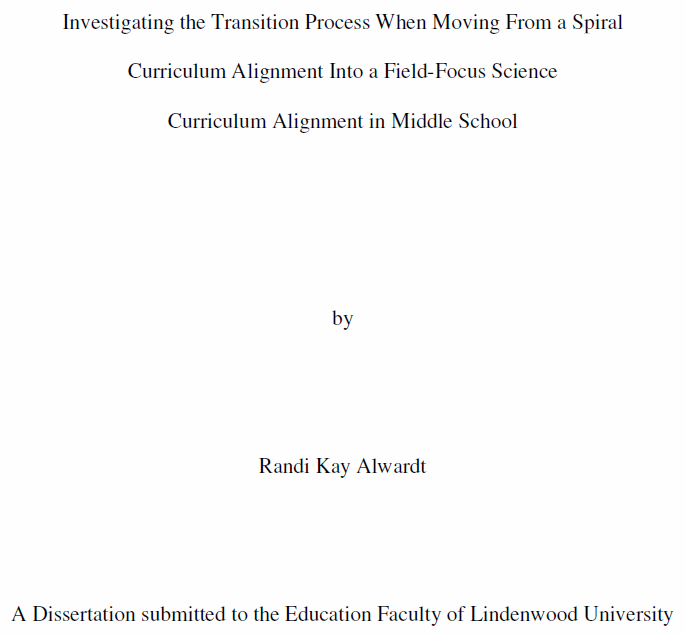 This investigation examined the transition from a spiral science curriculum to a field-focus science curriculum in middle school. A spiral science curriculum focuses on a small part of each field of science during each middle school year, more of a general science concept. In contrast to that, the base of a field-focus curriculum is that each grade level focuses on a specific field of science, more of a high school like concept. The literature reviewed provides a history of science education, the steps of the change process, and the importance of professional development. The literature review provided a basis for determining trends in the science education. The researcher collected a variety of data to understand the process that districts move through to transition to a field-focus science curriculum. 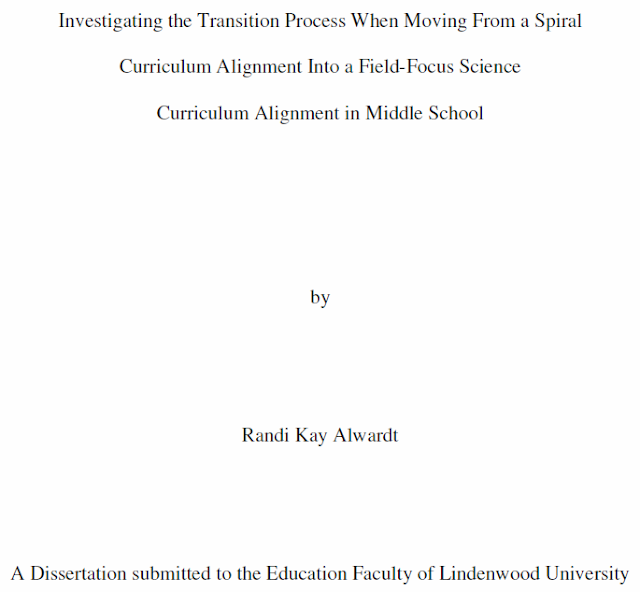 Interviews provided information concerning the transition process of three Midwestern school districts that have arranged their curriculum into a field-focus alignment. Teacher surveys of one district supplied the perceptions of the professional development involved during the transition process. The researcher also examined school district student achievement data in the area of science. Suggestions made through this investigation focused on the Eight Steps to a Successful Change when implementing a field-focus science curriculum alignment. Following the suggested steps will help a transition go smoother. Transition is always difficult so it is important that evidence supporting the reform is shared. In this particular case, data supporting the notion that a spiral approach leads only to a superficial treatment of topics and does not prepare students for the the rigor expected in standard tests. Communication is vital between supervisors and teachers. These need to be regular so that updates and concerns are immediately addressed. All necessary materials required for the new curriculum are promptly provided to all teachers. This effectively alleviates tension and anxiety toward the new curriculum. As Alwardt emphasizes, "Transitions are inherently difficult for teachers." While trying to adjust to the change, teachers still have the obligation to give the very best instruction to the students. There are no "dress rehearsals". It is therefore very important that teachers during this stage are heard and supported. With these in mind, one can evaluate how DepEd in the Philippines is implementing its K to 12. One should understand and appreciate the crucial role of teachers in education reform.